Florida Building Engineering and Inspections, Corp.
Florida Wind Mitigation Home Inspections are 100% Fully Guaranteed or Inspection is 100% FREE!!! Over ONE MILLION REPORTS ACCEPTED in Florida Hopefully You! Home Repair Referral Directory for Florida! QUICK CONTACT: In Florida if you need and/or desire Quick Immediate Assistance and wish for us to CONTACT YOU regarding a Florida Home Inspection. We will respond and CONTACT YOU IMMEDIATELY regarding you Home and Inspection Questions. For immediate assistance in Florida please Click Quick Contact. 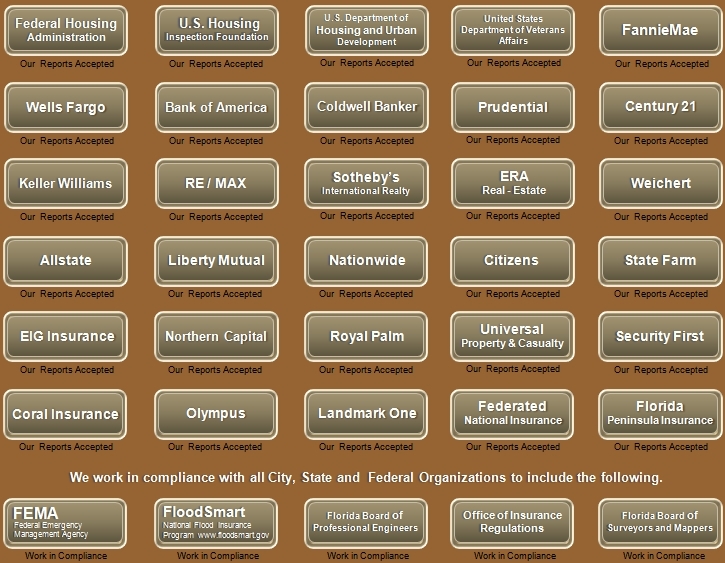 WE have had over One Million Reports Accepted in Florida and FULLY 100% GUARANTEE ALL ENGINEERING INSPECTIONS. Our Engineering Firm will save you up top 50% OFF Homeowners Insurance or the INSPECTION IS FREE!!! Florida Building Engineering and Inspections, Corp. consists of 32 Florida Licensed Engineers, Architects, Land Surveyors and Inspectors providing the Best Service, the Lowest Prices and the Fastest Turnaround Time for Mitigation Inspections in Florida. Over One Million Reports have been accepted from our Engineering Firm in Florida by the United States Federal Government, the State Florida, Florida Industry, Corporations, Commercial and all of the Private Sectors. Hopefully you! Wind Mitigation Inspections in Florida allow for Florida Homeowners to have peace of mind gaining knowledge of the condition of their home and how the home will withstand a Natural Disaster with the focus on Florida Hurricanes. Florida is a very “HARD HIT” Hurricane State. Hurricanes in Florida have caused horrific damage. Florida Homeowners Insurance is a vital necessity in Florida and a Wind Mitigation Inspection may save you $1,000’s of Dollars on Insurance. Our “Targeted Engineering” Florida Wind Mitigation Inspections cover all aspects of Home Safety and Hurricane readiness by geographical location in Florida. Providing services to all Florida Counties, Cities, Towns and Communities to include all Florida Coastal Areas for any Home, Homeowner and ALL Homeowners in Florida. Our Engineering Firm provides “Targeted Engineering” Wind Mitigation Inspections with our “Reports Accepted” by the Real Estate and Insurance Industries to also include; Banks, Mortgage Companies, Attorneys, Title and Deed Corporations, Lenders as well as the Florida Judicial System though our the State of Florida. Hurricanes create “WIND” that can cause damage to a Florida Homes Roof, Walls, Foundation of the Home by Shearing Forces that also place tremendous pressure on Doors, Garage Door and Windows. Even a small hole in a Roof, can become large enough to destroy the Home during a Hurricane. It’s that simple and easy to understand if you have been in a Hurricane. Peoples lives are in the balance in some cases and due to deficiencies in the Homes Structure and/or the Devastating Hurricane Environment many have lost their lives. From Flooding during a Hurricane that may cause Water Damage to the Foundation of the Home, causing the “Home to Collapse”. To loose “Roofing Tiles” that become “Missile Like Projectiles” during the immense Winds a Hurricane produces. A Florida Wind Mitigation Home Inspection is a vital part of protecting your most important investment being your Families Safety, your Home and your Property. Our Engineering Firms Reports are NON-BIOS and “All Licensed Engineers” in the State of Florida are ruled by Florida Guidelines regarding Ethical Conduct. Our Mission is to provide the Florida Homeowner with a “Targeted Engineering” Inspection so that the “Engineering Report Provided” may be a value to the Homeowner, save them money on Insurance and in some cases save lives. If you need assistance call Toll Free and speak directly at NO CHARGE to one of our Licensed Florida Engineers. For additional information please select you County. Florida Building Engineering and Inspections Corp.
CHAT LIVE SUPPORT: Have a question? Need to make a informed decision regarding your Florida Home? Don’t know what type of Florida Home Inspection you require? We are here to provide the Best Service at the Lowest Prices. All Engineering Inspections ate 100% Fully Guaranteed or the Home Inspection is FREE. Click Live Support.